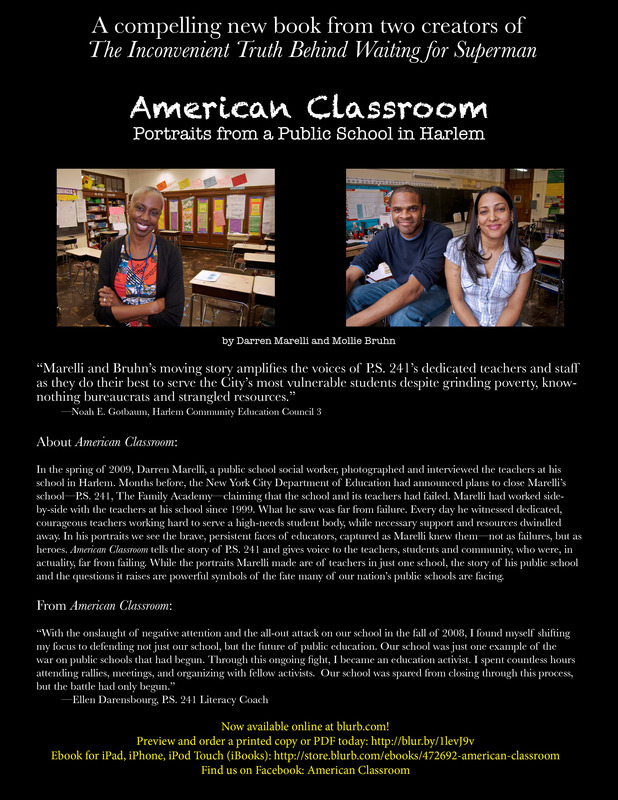 In the spring of 2009, Darren Marelli, a public school social worker, photographed and interviewed the teachers at his school in Harlem. Months before, the New York City Department of Education had announced plans to close Marelli’s school—P.S. 241, The Family Academy—claiming that the school and its teachers had failed. Marelli had worked side-by-side with the teachers at his school since 1999. What he saw was far from failure. Every day he witnessed dedicated, courageous teachers working hard to serve a high-needs student body, while necessary support and resources dwindled away. In his portraits we see the brave, persistent faces of educators, captured as Marelli knew them—not as failures, but as heroes. “American Classroom” tells the story of P.S. 241 and gives voice to the teachers, students and community, who were, in actuality, far from failing. While the portraits Marelli made are of teachers in just one school, the story of his public school and the questions it raises are powerful symbols of the fate many of our nation’s public schools are facing. The Success Academy Charter School Network, featured in “Waiting for Superman,” claims to have some of the “best” test scores in NYC. However, the network also has an excessively high suspension rate and a pattern of counseling out students who do not conform to their standards of conduct and achievement. Karen Sprowal tells the story of her kindergarten son’s 12 days at Success Academy Charter School. Ms. Sprowal describes how her son was pushed out of the school and eventually embraced by a neighborhood public school, PS 75. Please watch and share! A group of New York City public school teachers and parents from the Grassroots Education Movement wrote and produced this documentary in response to Davis Guggenheim’s highly misleading film, Waiting for “Superman.” Guggenheim’s film would have audiences believe that free-market competition, standardized tests, destroying teacher unions, and above all, the proliferation of charter schools are just what this country needs to create great schools. 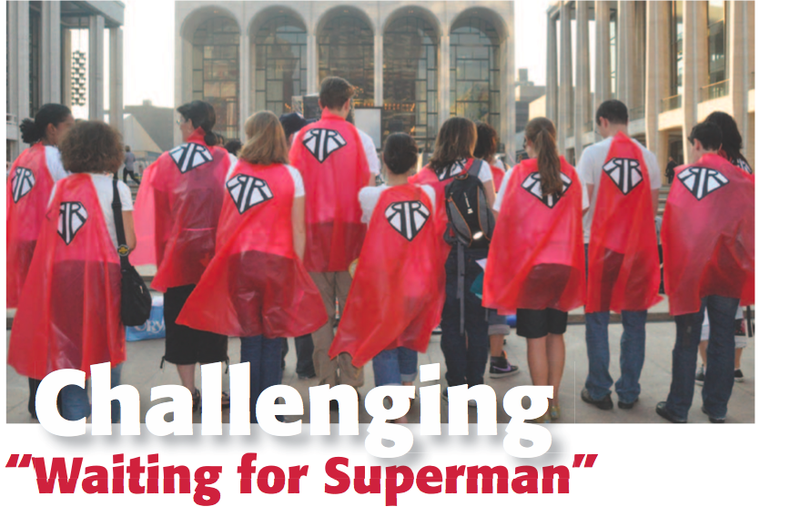 The film, The Inconvenient Truth Behind Waiting for Superman highlights the real life experiences of public school parents and educators to show how these so-called reforms are actually hurting education. The film talks about the kinds of real reform–inside schools and in society as a whole–that we urgently need to genuinely transform education in this country. Since the official premiere of GEM’s film at the Assembly Hall of The Riverside Church in Harlem on May 19, 2011 featuring historian Diane Ravitch as our honored guest, our free offer of the DVD and permission to copy and distribute copies of the film have produced an estimated 15,000 copies in circulation. Requests have come in from all 50 states and 6 continents. Screenings have been set up by unions, parent groups, college professors and libraries all over the nation, in India, Turkey, England, New Zealand and Australia. ORDER A DVD FOR YOURSELF HERE.